New Winter 2018: This personalized jet ski ornament has a pro look to it that many lack. The rider is fully geared up in helmet and wetsuit for all-weather jet skiing. 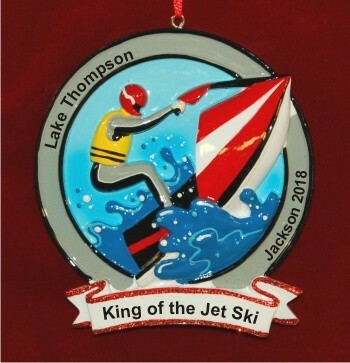 The jet ski memories personalized Christmas ornament is a gift any enthusiast will enjoy, whether they ride casually on a local lake or take their personal watercraft out on big water to race competitively. This is one of several personalized jet ski ornaments available from Russell Rhodes, and the information you supply will be hand personalized in a handsome font to create a unique gift. Capture the fun forever with the pro water ski ornament personalized to be unique.